Kasey Reisman has served as our Vice President, Deputy General Counsel and Assistant Secretary since July 2016. 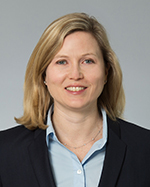 Prior to joining AGNC Investment Corp., Ms. Reisman was Vice President and Assistant General Counsel of American Capital, Ltd. At American Capital, Ms. Reisman worked on the company’s investment portfolio, including corporate governance, due diligence and regulatory matters for sponsor finance and buyout transactions. In addition, she handled compliance matters under the Investment Company Act and the Investment Advisers Act for both American Capital and its asset management business advising public companies and private funds. Her portfolio at American Capital included counseling AGNC Investment Corp. on regulatory and compliance matters. Prior to joining American Capital in 2005, Ms. Reisman was an Associate in the Financial Services group of Dechert LLP in Washington, D.C.
Ms. Reisman received her J.D. from Vanderbilt University Law School and her Bachelor of Science in Foreign Service from Georgetown University. Ms. Reisman is a member of the Virginia and District of Columbia Bars.